Homeowners are always on the lookout to make sure their home is in peak condition, and a home’s roof should be no exception, especially given that a roof in good condition is a valuable improvement to home buyers. While it may be difficult to know what to look for when it comes to a damaged roof, there are a few telltale signs that all homeowners should keep an eye on when doing a regular inspection. Here are five different types of damage homeowners may spot on their home’s roof and what it means. In autumn, homeowners may notice while cleaning leaves out of their gutters that there are shingle granules at the bottom. While this is normal for new shingles, as some of the granules are loosely applied and will come off easily, for an older roof, it means that the shingles are getting old. Fortunately, this isn’t a death sentence for roofs. Though it means that replacement is imminent and should be done in the next few years, it isn’t yet an emergency. Missing shingles is often the easiest way to identify roof damage as there will be obvious gaps in the roof where they should be. In heavy rain or wind, it can be common for shingles to be ripped off of a roof, especially if the roof is already getting old. However, if the roof is new and there are shingles missing, it likely means that the shingles weren’t properly installed, and the homeowner should call their roofer to alert them of the problem. In any case of missing shingles, the homeowner should call a roofer quickly because the gaps can allow leaks inside the home. Along with extreme weather conditions pulling shingles off a home, they can also cause them to break, curl, and crack. Most of the time, this sort of damage is caused by extreme heat and cold, and any damage like this can lead moisture and wind to get into the home just like as if the shingles were missing. While broken and misshapen shingles aren’t quite as noticeable as missing shingles, homeowners can spot them by looking to see if the shingles are laying flat and by looking for small gaps between them. Hail is known to damage anything it slams into, especially when it gets larger, and roofs are no exception. 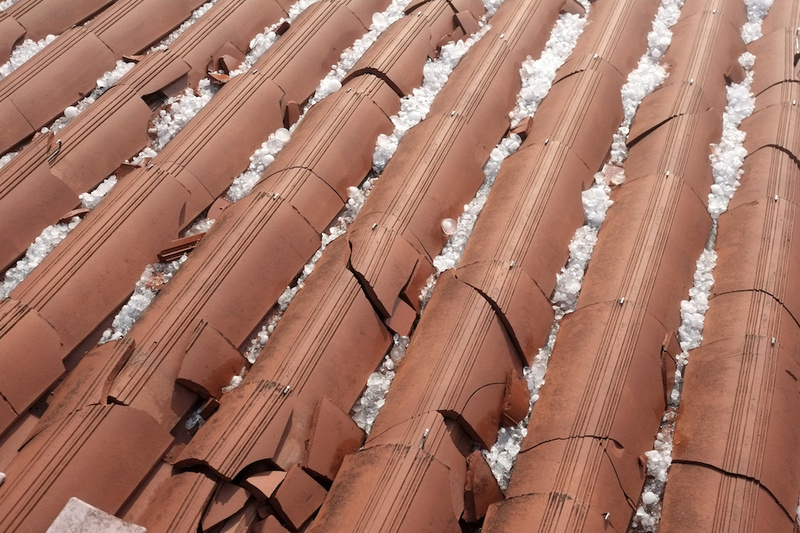 After a hailstorm, homeowners should pull out the ladder and look at their roof. If there are circular areas on the shingles where the granules are missing, that’s a sign of damage from hail. If you’re having difficulties spotting damage on the roof, try looking at the gutters or air conditioner. If they have dents from hail, it’s very likely that the roof felt the impact as well. Not all homeowners go into the attic very often. However, when the homeowner suspects roof damage or sees definite signs of it, going into the attic can be very helpful in seeing just how bad the damage is. On a sunny day, homeowners may spot sunlight streaming through cracks in the roof, and if that’s the case, it means that wind and rain can get in as well. If this is the case, homeowners should keep an eye out for mold growth or hire a professional who can identify it. Keeping these five things in mind during while inspecting a home can help Madeira homeowners identify damage on their roof. When damage has been found, be sure to hire a professional roofer who can repair or replace it.